Mike Congilosi II over at Lightning Boy let me know about a great new thing they’re working on – The Lightning Boy II which is a module high voltage vacuum tube overdrive pedal. Check out the great video below! 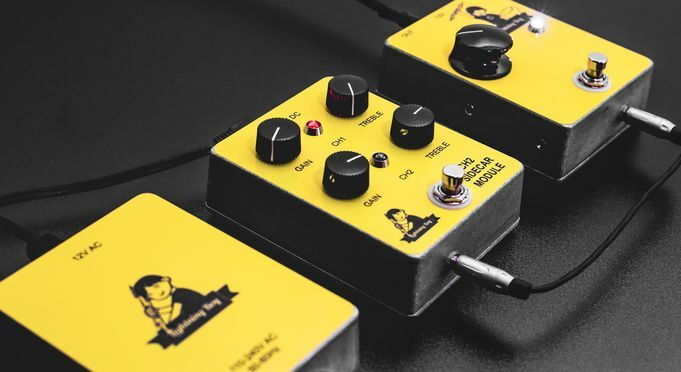 Press Release – For immediate release: Lightning Boy Audio (LBA) announces the release of the Lightning Boy II, a high voltage vacuum tube powered overdrive pedal with modular expandability. The Lightning Boy II is a new take on an old favorite of LBA customers. The new pedal runs a 12AX7 at high voltage to deliver a unique flavor of tube overdrive with the headroom of an amp. Its simplistic feature set of just a single volume knob and true bypass stomp switch may appeal to some. For those seeking more, the Lightning Boy II offers expandability via LBA’s signature Sidecar Modules. Released by LBA at the same time is the CH2 Sidecar Module – the first of many Sidecar Modules to come. This module adds dual channels to the Lightning Boy II, which can be toggled between using the CH2’s foot switch. The CH2 offers gain and treble controls for both channels, along with LED indication for the active channels. The EQ circuit is a unique circuit design by LBA, which allows for boost and reduction of treble frequencies using a custom inductor. The gain and treble controls are active functions, powered directly from the tube onboard the Lightning Boy II. Sidecar Modules connect to the Lightning Boy II with an included cable. An external power adapter is not required for the CH2, but it is necessary to light up its onboard LED indicator lights. The CH2 accepts a standard 9v DC barrel jack for power. The Lightning Boy II gets its power from a 12v AC source, not to be confused with 12v DC. LBA is offering a generic wall wart style 12v AC adapter for $15, or the LBA 12VAC PSU, which is a low noise international power supply for $38. The Lightning Boy II sells direct from www.lightningboyaudio.com for $235 USD. The CH2 is selling for $119.